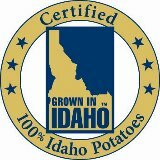 *This post is sponsored by the Idaho Potato Commission in conjunction with a social media campaign through Sunday Supper LLC. All opinions are my own. These Loaded Baked Potato Stuffed Mushrooms are a really fun twist on traditional loaded baked potatoes…..how about a bite-size version stuffed into a baby portabello mushroom?! If you love everything about a loaded baked potato, then you must try this appetizer version that’s fun to eat and serve. You get all that cheesy, flavorful potato goodness in a small, tasty package. 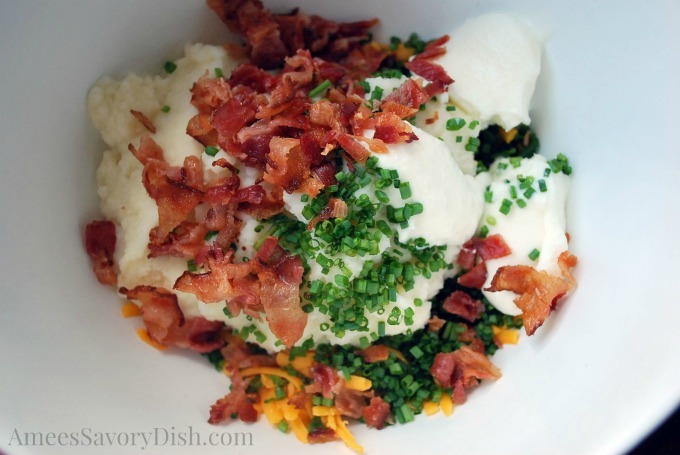 It’s also a great way to use up leftover mashed potatoes! I’m not sure about you, but I could eat this filling right out of the bowl! These flavors go together so beautifully…. No time to peel, boil and mash potatoes? No worries! Just scrub a couple of Idaho® russet potatoes under running water, pat dry and prick a few times with a fork. Place on a microwave-safe plate and cook for 5 minutes. Flip potatoes over and cook 5-6 minutes more, until potato pierces easily with a fork. Scoop flesh from baked potato and add just enough milk or cream to get a mashed potato consistency (it won’t take much). Measure out 1 cup mashed potatoes for your recipe. For more delicious potato inspiration, be sure and follow Idaho® Potatoes on Pinterest, Facebook, Twitter and Instagram. Now, be sure and check out all of the amazing potato creations from my Sunday Supper friends below! Yep, I could eat the filling right from the bowl too. Hi Renee! Yes, it’s so good!! What a marvelous twist on stuffed mushrooms! The filling sounds incredible!! Two of my faves in one awesome appetizer. Heaven!! I think I could live off stuffed veggies. 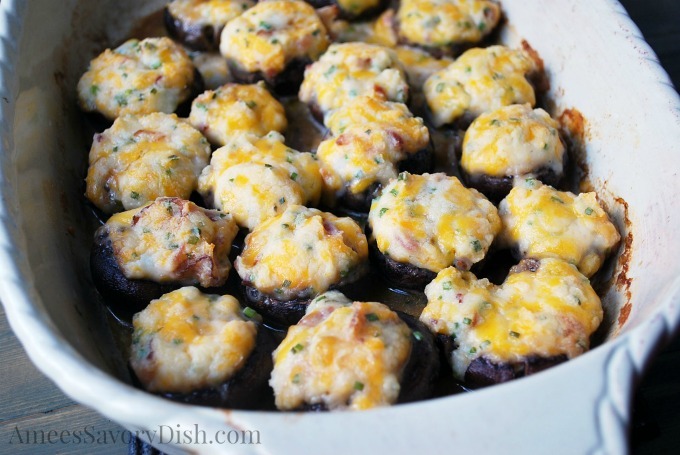 Totally need to make these stuffed mushrooms – they look super delicious, creamy and cheesy. Everything I love! I love stuffed mushrooms and these look incredible. Thanks for sharing. I love stuffed mushrooms! Potatoes sound awesome in here! What a fantastic twist on stuffed mushrooms! A must-try for sure!! I’m quite certain I would love these! I love everything inside the mushrooms and I absolutely love mushrooms! How cute and flavorful!Would love to try these! I would happily eat that entire batch, these look incredible! 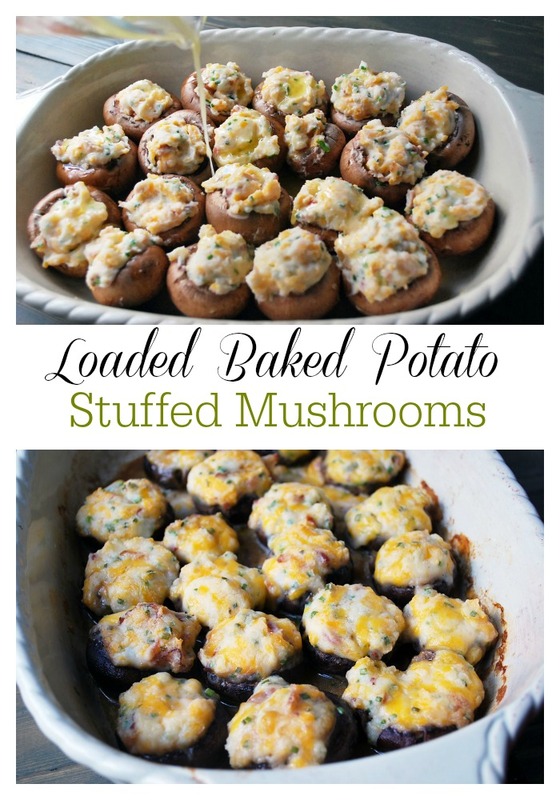 I love loaded baked potatoes and stuffed mushrooms … why have I never thought to combine them? You’re a genius! I claim 5 of those for my entree for dinner! What a fabulous and low calorie way to enjoy a loaded baked potato. I could eat the entire plate. Such wonderful flavors! I love the combo! Best ever potato recipe i ever saw.